The next 6 weeks – what should we do? The most radical action you can take right now is ‘Talk About Politics‘. Talk to those who don’t agree with yours well as friends and colleagues – open the conversation. Find out what they think as well as telling them what you think. There is great power in conversation. Talk about voting – persuade people to vote. Whoever you vote for you are using some political power that has been given to you by the state. Talk about oppression – how are poor people treated? what do minorities think about politics? Do you think it’s right that some people control all the money? What rights should workers have? Oppression is real and all around us, and talking about it might help us realise what we want the Government to do. It might help you decide what sort of Government you want. Talk about the NHS – if you want to keep ‘free at the point of use’, then talk about how its’ being sold off. Talk to workers in the NHS and find out what they think they need from a Government. Talk about education – What do our schools need, what do our teachers think…and what do our children know about General Election. Talk about security and the arms trade – Are you happy with us keeping nuclear weapons, with selling arms to regimes that kill their people or neighbours? What security would like us to have? 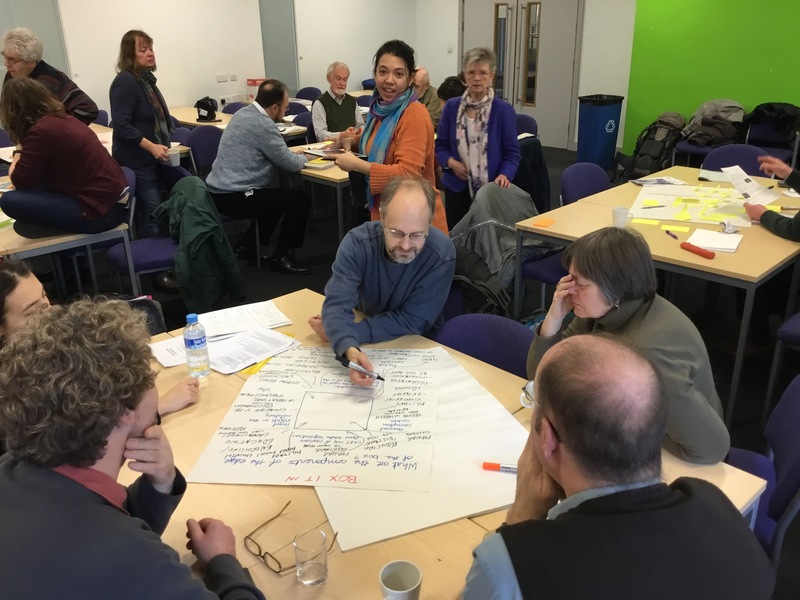 Talk in the work clubs and the community centres – what do you think the General Election is about, what do you care about. Any idea how to make your views clear to politicians. Invite people in, get cups of tea brewing and a safe place to talk. Talk in the food banks – is everyone registered to vote – does everyone even know there is going to a be a General Election? For the next 6 weeks we are living in a political space. The decisions we make on June 8th will have a big effect on us for decades to come. Giving people the information to make a decision is one of the most powerful and radical acts we can do today. This is a time when party political messages will dominate the media…but real people – us – have real concerns, the things that affect our daily lives, and through talking with one another we will share them, and find out that other people feel just as interested, frustrated, inspired, tired, thoughtful, questioning or fearful as ourselves…and there is power in that sharing. Why is a conversation going to help? The political elites (including media) will try to restrict the topics and the issues that we talk about – but it’s not just Brexit and the economy. The everyday things in our lives are part of this General Election as well – the NHS, the need for social welfare benefits, security and nuclear weapons, education – the funding and the value of teachers. Talking, discussion, sharing our views about politics is something that we are discouraged from doing. In the 1970′s when women started sharing experiences about their lives they created a movement and a momentum that changed the social structures of the UK – People talking together creates power and changes the way we live. Let’s put oppression in the conversation. Let’s make the UK a political space.